I like to serve leg of lamb spiced in the mediterranean way, with an aubergine purée, some red onion compote and some freshly grilled greens. You can make a sauce too from the drippings. If you’re lucky enough to have one of those fancy vacuum machines like I do, throw the leg in a bag with the marinade and vacuum it up, leaving it in the fridge overnight. 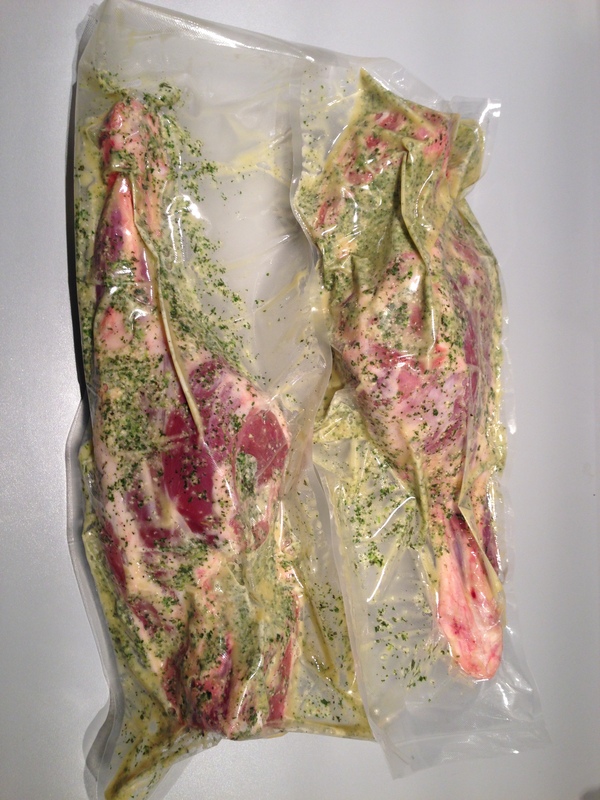 If not, use a plastic bag, and try to cover it well in the marinade before wrapping it up and putting in the fridge. If you didn’t marinate the night before, go up a couple steps, make the marinade mix and get the meat slathered in that stuff before you put the meat on the grill. If you did, take the meat out of the bag, but save up the marinade leftovers for later. Remember to get the smoke going before putting the meat on. 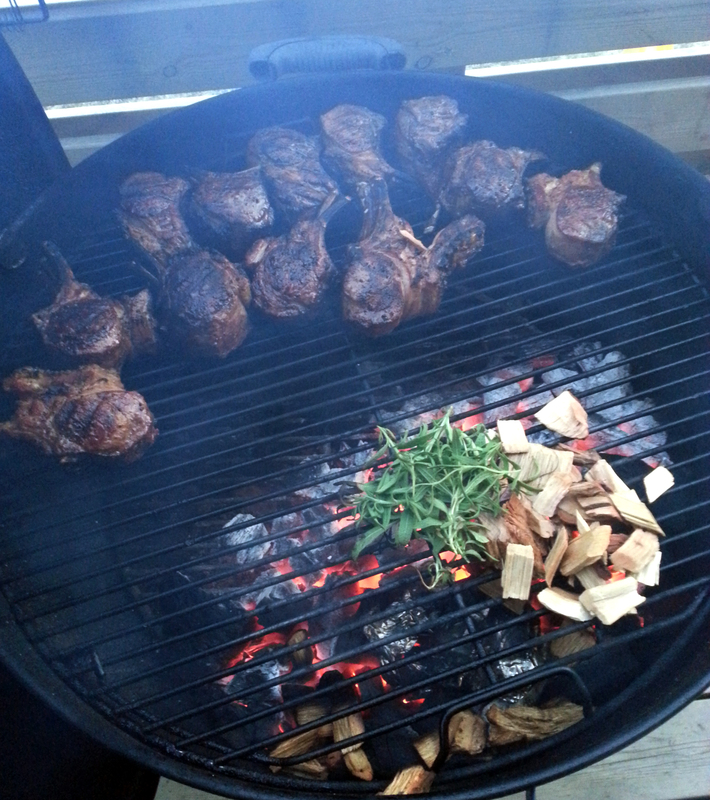 I like to mix rosemary branches with hickory for lamb smoking. Add some water to your drip pan. Not a lot, this is just to keep the drippings from burning, remember you will make that into a sauce later. Add a temperature probe to the meatiest part of the leg, and add another one to the grill grate to monitor grill temperature. You don’t have a two-probe style wireless thermometer yet you say? Go and get yourself one. I have been using the Maverick ET-732 for a couple years, and it works quite well. Once the meat reaches an internal temperature of exactly 68C (155F), take it off the grill, wrap it in a double layer of aluminium foil, and wrap that in a plastic bag, then a couple towels. Ideally you want to rest the leg for at least one hour, but if you’re done well ahead of dinner, resting it for 2-3 or even 4 hours is not a problem at all. Take out the drip pan, put the sauce in a pot, and make a delicious sauce. Adding some red wine, salt and pepper to taste and reducing until you have the desired consistency is a good idea. If the sauce is too sharp, some honey might be able to help you out. 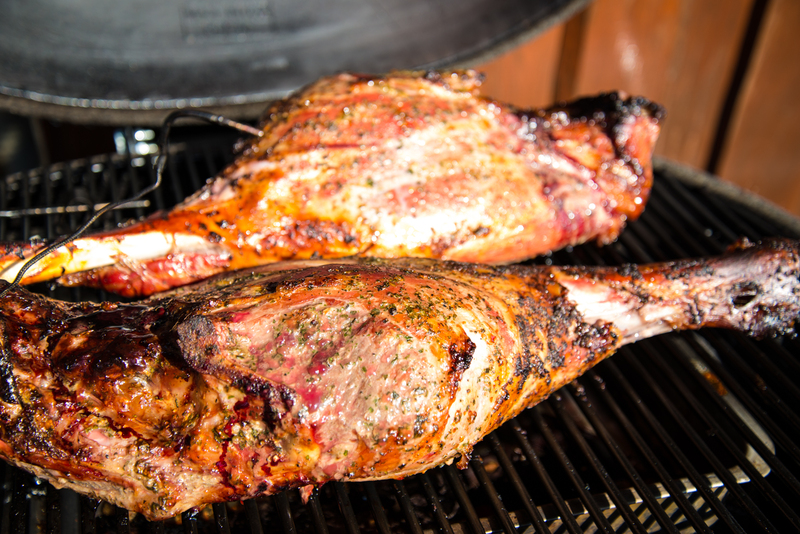 When you are about ready to serve, fire the grill up for direct cooking at a temp of about 150-160C (300-320F), brush the leg with any marinade leftovers, and finish the leg off over direct heat. 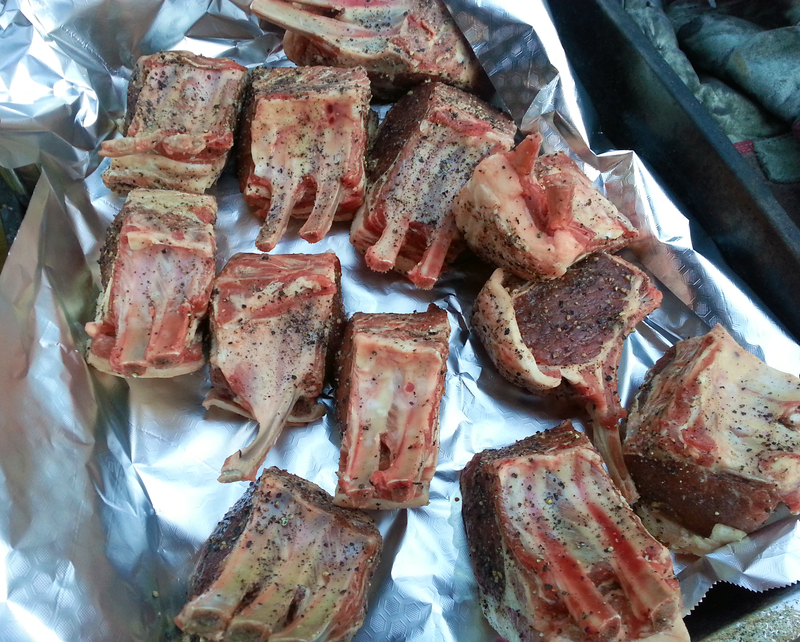 The goal here is to get a nice sear before serving, and crisping up the outside. 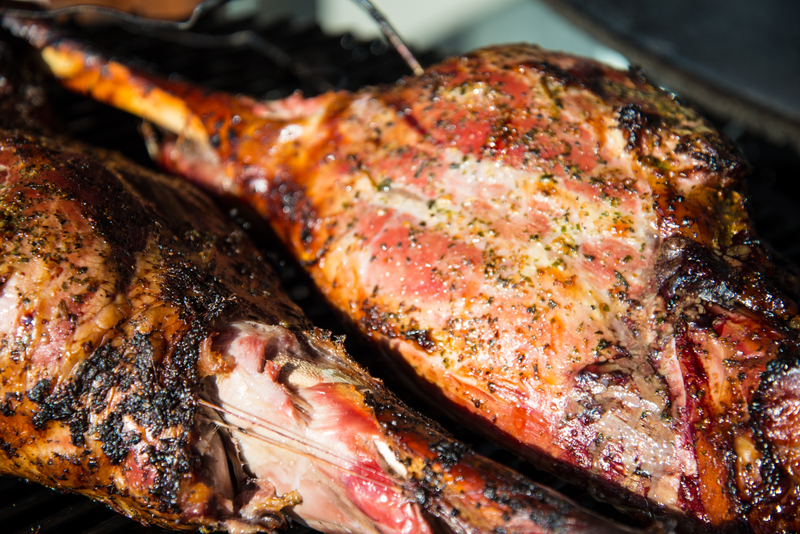 Let the lamb rest for 5-10 minutes again, while you grill up some fresh spring oninon and/or asparagus. Serve and enjoy! 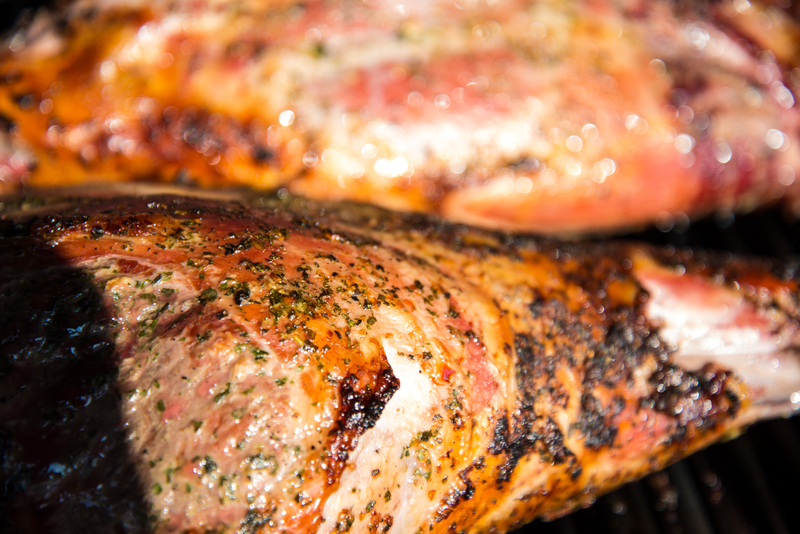 There’s not much that can top some fresh young lamb for the grill. In this recipe we’ll pair it with some hickory and rosemary smoke, raw spring onions finely chopped and a delicious mint oil to go with your preferred side. Let’s roll! 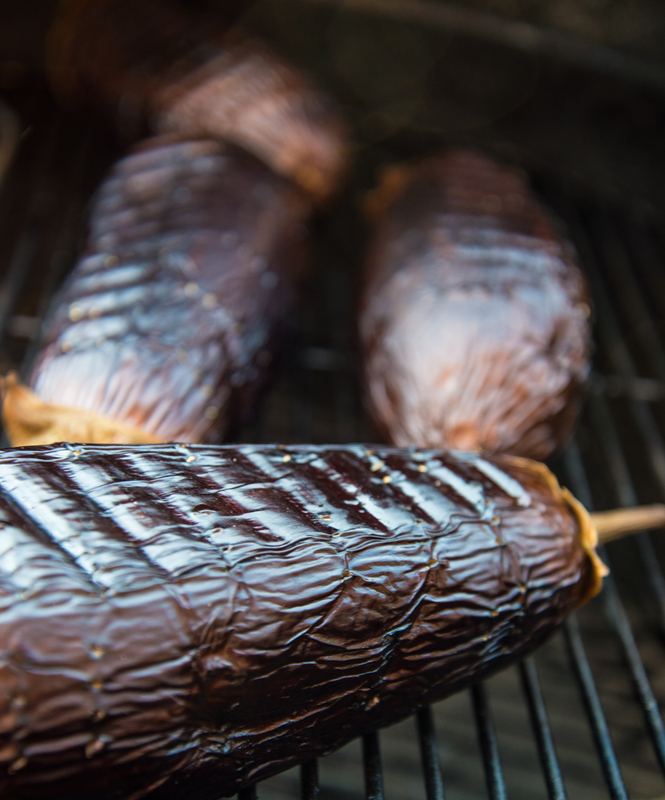 Once your grill is nice and hot, might be a good time to dump some yams on there for a side dish, my recipe for ember-roasted yams is great with the mint oil. Slice a nice little diamond pattern in the fatty parts of the rack, making sure not to slice into the meat. This is to help the fat render, and to help with the crispiness of the skin. Important! Once your yams (if youre doing those) are done and out of the way, get the grill real hot (you want the grate to be so hot it whitens for this one), and chuck in the rosemary and hickory chips right on the coals. The smoke will start fairly instantly, so get your chops on there (I usually do fatty side down first), and put the lid on for about a minute. Repeat for all sides so you get a good sear all round.